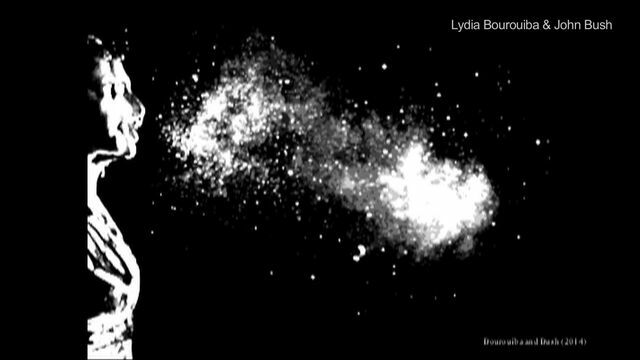 Your cough or sneeze infected with a cold or flu travels much farther than scientists previously thought -- potentially spreading disease-causing pathogens in a wide spray. A new study from MIT scientists warns coughs and sneezes breed gas clouds that travel between five and 200 times beyond the individual droplets that were thought to fall in groups. "When you cough or sneeze, you see the droplets, or feel them if someone sneezes on you," explained John Bush, a professor of applied mathematics at MIT, in statement. "But you don't see the cloud, the invisible gas phase." Bush said the new findings could change what's known about the footprint of disease pathogens after they are expelled from the body. In other words, the research could give you more of a reason to cover your cough or sneeze with your elbow when you're feeling sick at school or the office, or riding the train. For the study, researchers took high-speed imaging of coughs and sneezes (seen in video above), and also used mathematical modeling and simulations to study the fluid mechanics of the projectile droplets we secrete when we're under the weather. Previous wisdom was that larger sneeze droplets fly farther than smaller ones due to greater momentum, but the up-close observations showed that wasn't the case. Instead, a cough or sneeze forms more of a cloud, as if it is coming out of a smokestack, Bush explained; he dubbed it the "multiphase turbulent buoyant cloud." "We have shown that there's a circulation within the cloud," he said. "Basically, small drops can be carried a great distance by this gas cloud while the larger drops fall out. So you have a reversal in the dependence of range on size." That means a sneeze picks up surrounding air that recirculates smaller droplets, before they fall out or evaporate. They estimated that droplets 100 micrometers in diameter traveled five times farther than previously estimated, while droplets 10 micrometers in diameter travel 200 times farther. Droplets in the 50-micrometer range varied in expulsion distance. The research was published April 8 in the Journal of Fluid Mechanics. Colds, sniffles and flu are not the only diseases that spread through infected droplets. Highly-contagious measles spread through infected droplets from a person's nose, mouth or throat, so do mumps, tuberculosis, strep throat, meningitis and chickenpox. The Centers for Disease Control and Prevention recommends sneezing into your elbow instead of your hand or covering your nose and mouth with a tissue and throwing it away after to reduce the spread of disease.